REDSTONE ARSENAL, Ala. -- One Soldier proves childhood dreams can come true as she prepares to launch into space for her first time. U.S. Army Astronaut Lt. Col. Anne C. McClain, along with her crewmates, David Saint-Jacques of the Canadian Space Agency and Oleg Kononenko of the Russian Space Agency Roscosmos, is scheduled to launch Dec. 20 aboard the Soyuz MS-11 spacecraft from the Baikonur Cosmodrome in Kazakhstan for a six-month rotation on the International Space Station. "When you look over the history of human space flight during the past 50 years, it is a relatively short time," McClain said. "Every vehicle that has been built and every flight that has been taken is an accomplishment in and of itself. We have been flying to the space station for about 18 years and the thing we are always doing at all of our agencies is 'What's next?' What is the next step we can take where mankind has never been before? For us, that is deep space. "At the crew level we are fortunate," she continued. "We have been training together more than a year for this flight. It is actually very easy to forget we are from three different countries and three different places because we are doing the same things together every day. We have the same concerns and the same issues in dealing with our families and we just connect as human beings. At the end of the day, the Earth is a small place and we are all in it together. The decisions we make affect one another. From our perspectives, rather than taking politics and letting them inform our friendships, we actually take our friendships and let them inform our view of how politics should be and how our world could be. "The peaceful exploration of space is absolutely a unifying aspect," McClain added. 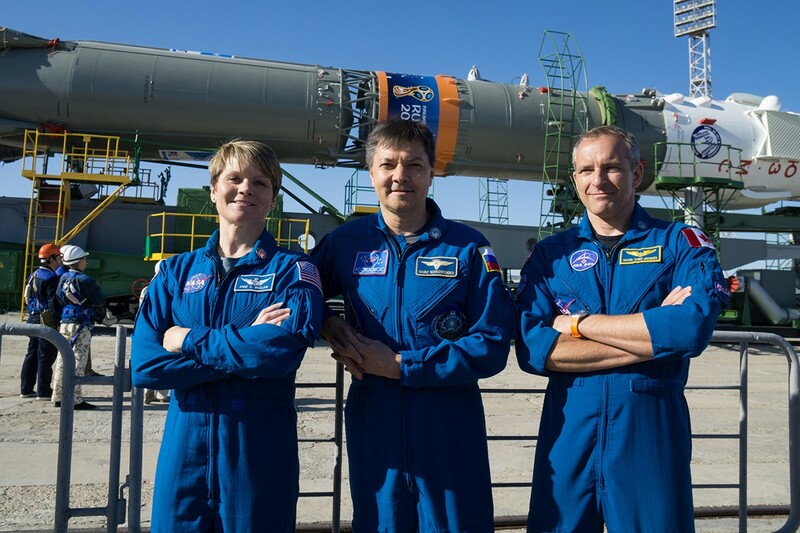 "Working with this crew is an incredible opportunity, but it is also an example of what humans can do when we put aside our differences and really focus on what motivates us." McClain is a native of Spokane, Washington, and earned her undergraduate degree from the U.S. Military Academy at West Point, New York. Additionally, she earned two Master's degrees while studying in England. She was a member of the USA Rugby Women's National Team and noted her experiences have played an integral role in helping her work with the international members of her NASA team. "We are not just going to the International Space Station to visit, we are going there to live. It will be our home, and we are going to adapt to it," McClain said. "When I go to Russia, it is absolutely a second home for me right now. I always tell people it is amazing the perspective you get when you get out of your comfort zone long enough to make it your comfort zone. "It is amazing to see how people on the other side of the world approach the exact same problems yet come up with different solutions," she added. "Getting comfortable in another culture really helps you understand perspectives and that we are not that different from one another." As a Soldier, McClain earned her wings as an OH-58D Kiowa Warrior scout/attack helicopter pilot. She has more than 2,000 flight hours and served at every level of Army Aviation units at Wheeler Army Airfield, Hawaii, and at Fort Rucker, Alabama, as well as combat operations during Operation Iraqi Freedom. "The Army has given me everything I have as an adult," McClain said. "It gave me my undergraduate college education and two master's degrees. It gave me flight school and test pilot school. But I think most importantly the Army gave me really humbling, selfless leadership experience. I went into the Army probably a little over-confident in some of my abilities, and I came out very humbled and very in awe of the people I serve with and with a recognition that I could never accomplish remotely what others can when given the right tools. My biggest role as a leader or as a member of the team is to enable other people around me to perform at their optimal best. "I try to be the leader who synergizes the team and tries to recognize barriers to the team around me and knock those barriers down," she continued. "Our Soldiers in our military are some of the most innovative, smart, dedicated, selfless people who I have ever worked with in my life. I am humbled every day just to be in their ranks. I learned from them to trust the people around me. "Here at NASA our lives depend on each other every day," McClain added. "I was in a vacuum chamber last week that can be a real threat to your body. These guys put on my gloves and pants while doing a leak check to make sure everything was good. My life was in their hands last week and it will be again in the future. I learned to have that trust in the Army." In 2013, McClain attended the U.S. Naval Test Pilot School where she was selected as one of eight members of NASA's 21st astronaut class. Her astronaut candidate training included scientific and technical briefings, intensive instruction in ISS systems, spacewalks, robotics, physiological training, T-38 flight training, and water and wilderness survival training. She completed astronaut training in 2015. "If you do the thing everybody else does, you are going to get what everybody else does," McClain said. "If you want to do something amazing and something great, you need to start being different today and stay dedicated to that. There is nothing you are doing that is not important so you must excel in everything you do." During the upcoming mission, McClain and her team will facilitate approximately 250 research investigations and technology demonstrations. She added that science experiments conducted in space yield benefits and technology advancements for all humanity and looks forward to achieving more scientific progress. "The benefit of science experiments in micro-gravity and low-earth orbit are too numerous to just leave and move onto the next thing," McClain said. "I am overwhelmed at the quantity of tasks we have, in a good way. One of the really neat things about going to the space station for six months is that we don't specialize. "One of the things I really like is getting into academic areas I had no experience with before," she continued. "I am an aerospace engineer by training and I was a test pilot in the Army. One of my favorite things now is biology and learning about the human body. To me this is really fascinating, and I could have had a totally different career and loved it also. "What I am most excited about is space walks. We have some 'penciled in' for our mission," McClain added. "It is what I dreamed of when I was a little 5-year-old girl and it is pretty neat to think that maybe in the next six months it could be happening."